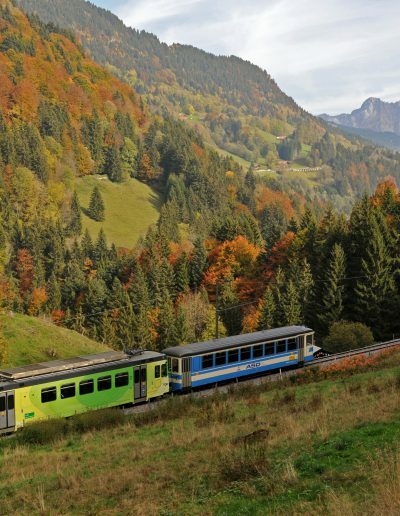 Visit the Alpes vaudoises on board the typical mountain trains that attract visitors to the area for a century. 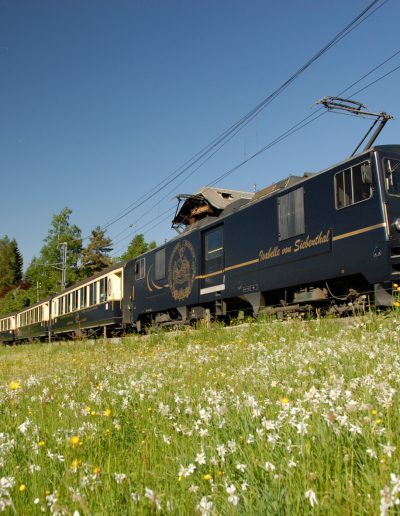 Between the vineyards of Chablais and the pastoral atmosphere of the Alps, this offer includes excursions by train and bus. 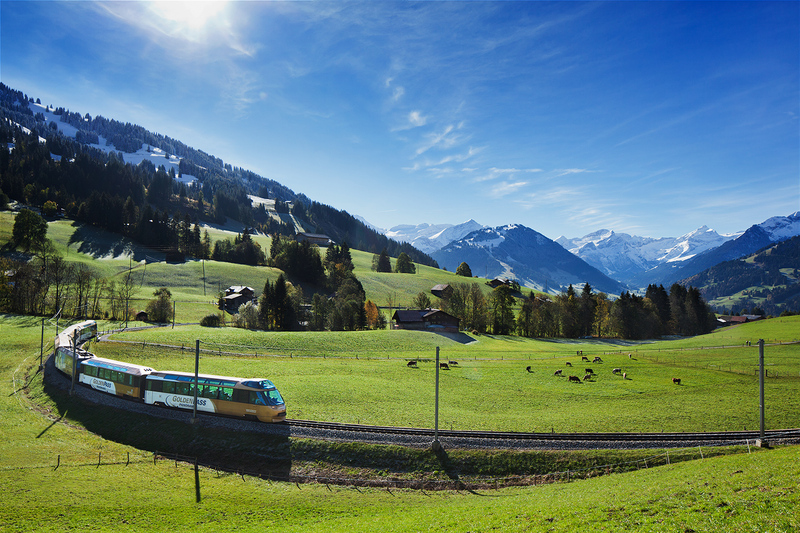 By train, easy access to major resorts such as Villars, Les Diablerets, Leysin and Château-d’Oex crossing idyllic landscapes. 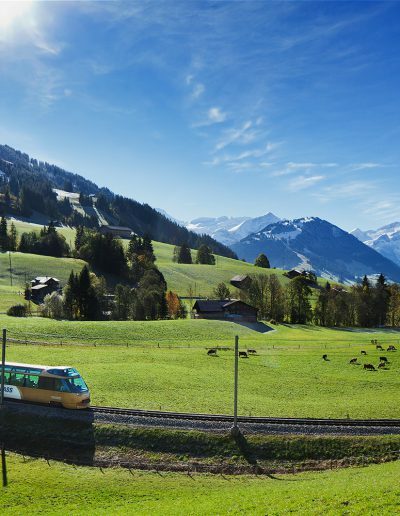 The journey takes place on narrow tracks from Aigle and Bex (cog train) or is carried out on a panoramic Goldenpass between Montreux and Gstaad. Meals are served at local restaurants chosen for their selection of local products. 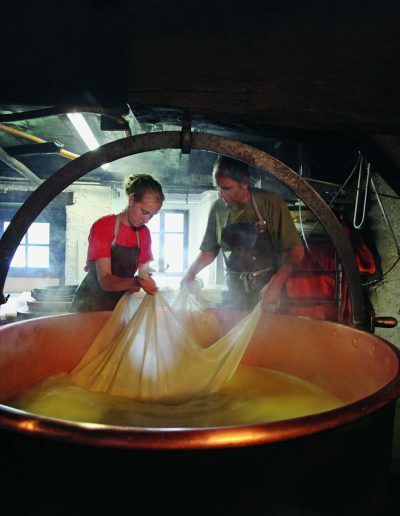 Visits and tastings are opportunities to meet the locals of these welcoming mountains. The steps and the length of stay can be tailored. When you change your hotel, you get a reliable luggage transfer service, up to one piece of 20kg per person. Travel with your friends and get up to 30% discount. 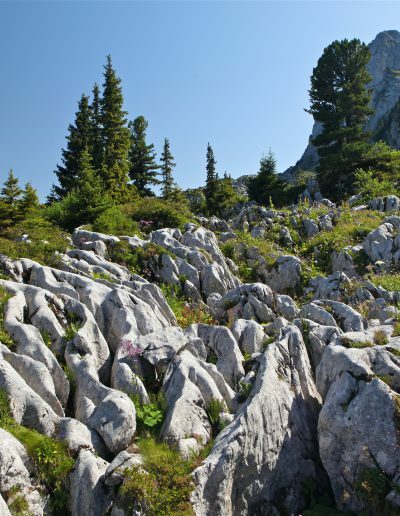 The key sites of the Alpes vaudoises that you will discover along the route. 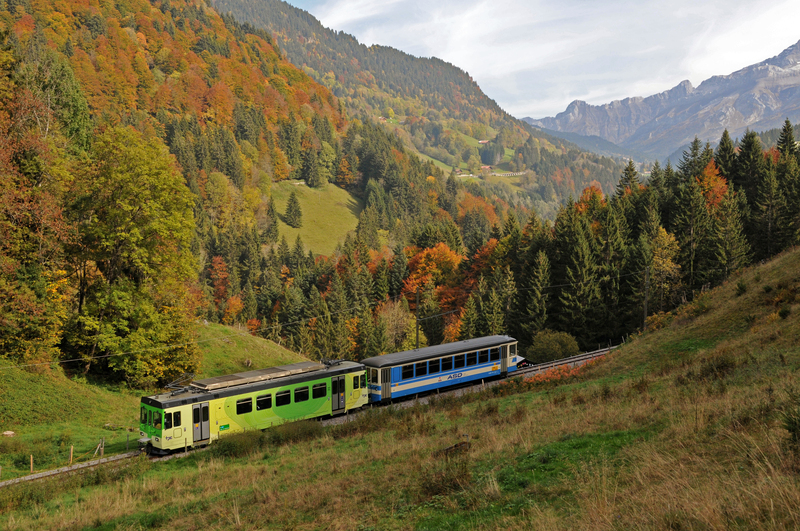 The Alpes vaudoises are also a goldmine for fans of narrow-gauge mountain railways: four panoramic lines, some of them with cogwheel trains, include the Montreux-Zweisimmen line passing through Château-d’Oex, as well as Aigle-Leysin and Aigle-Les Diablerets or Bex-Gryon-Villars, which continues as far as Bretaye. 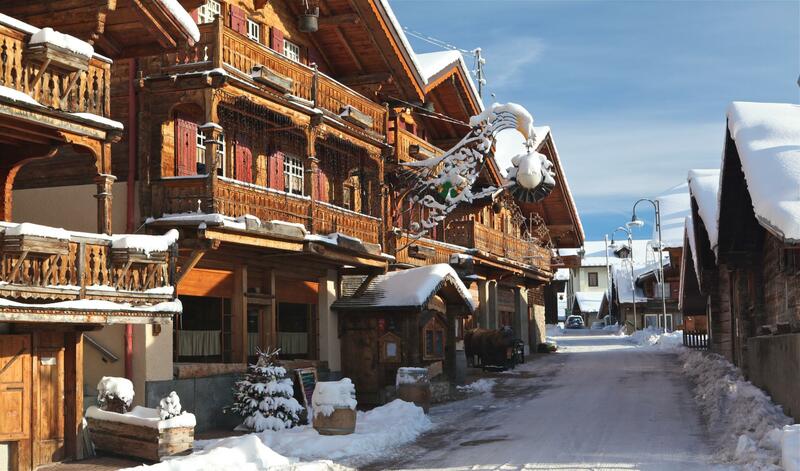 The main resorts of the Alpes vaudoises are easily accessible. 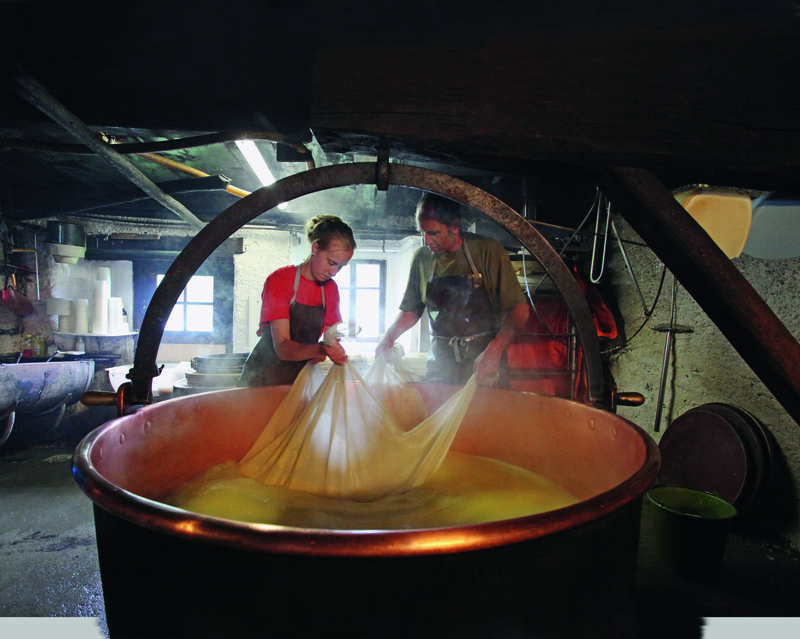 A holiday in the Alpes vaudoises offers a gastronomic interlude of the highest quality, from vineyards and wine cellars to Alpine cheese-making such as L’Etivaz AOP. Other attractions include traditional paper-cutting, salt mines, thermal springs, charming mountain villages, fantastic mountain lakes and impressive panoramas. Arched tunnels, vertiginous viaducts, winding contours traced at the edge of ravines, arc tunnels, breathtaking views: some of the strengths of the ASD, one of the most beautiful TPC lines. 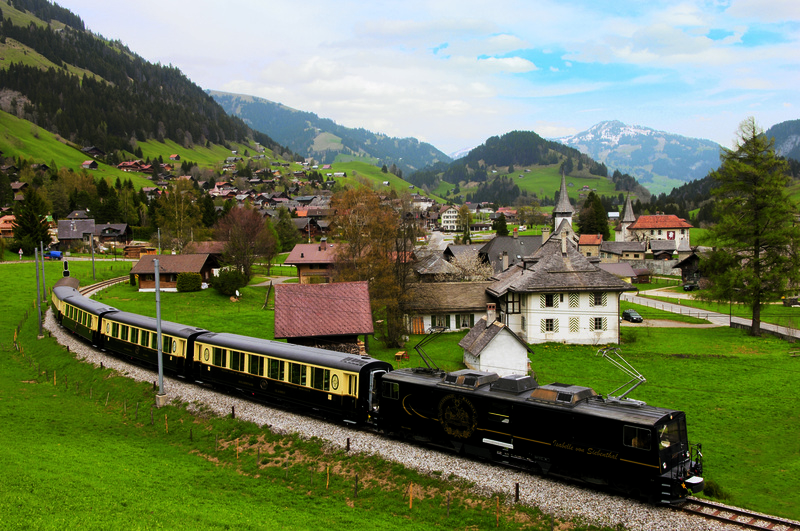 To the passengers, this train of discoveries illustrates the Swiss tradition of altitude railway. 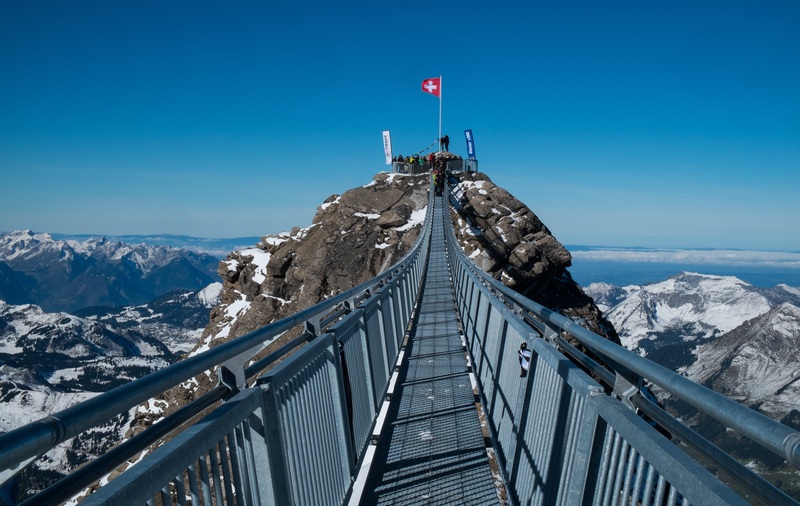 For residents, it represents an essential means of transport connecting mountain and plain — Dinner and overnight in Les Diablerets. 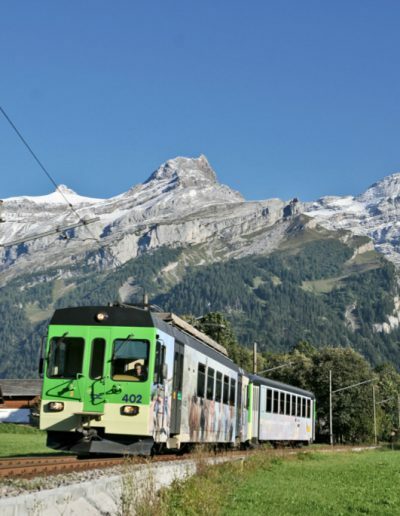 The railway line Aigle – Sépey – Les Diablerets is the most impressive line of the TPC company (Transports Publics du Chablais): the descent to Le Sépey through a landscape of villages, meadows and forests, with spectacular views on the Alps and the Rhone valley. 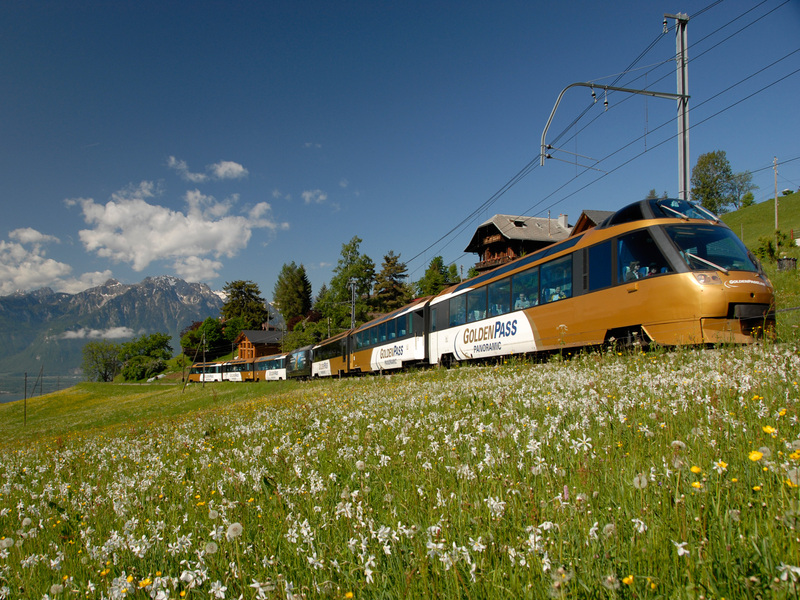 The famous Postbus ensures the correspondence between Le Sépey and Leysin — Dinner and overnight in Leysin. 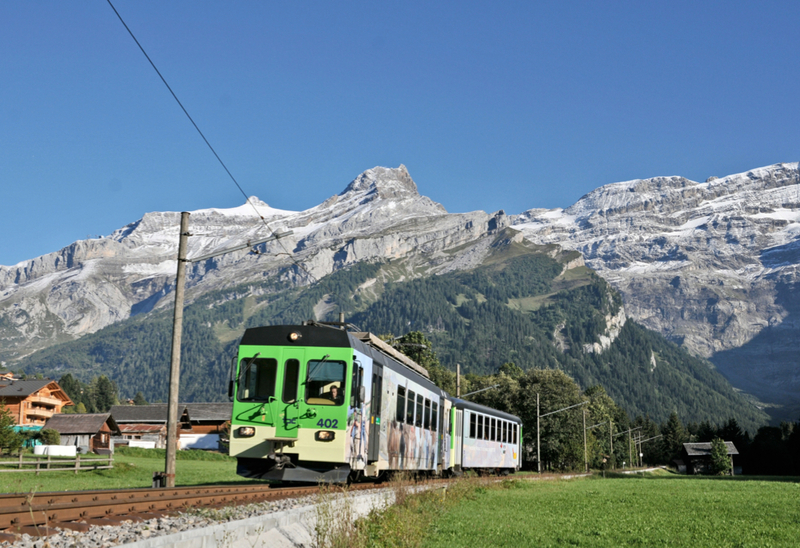 From Leysin, many visitors take the cogwheel train taking you to Aigle. 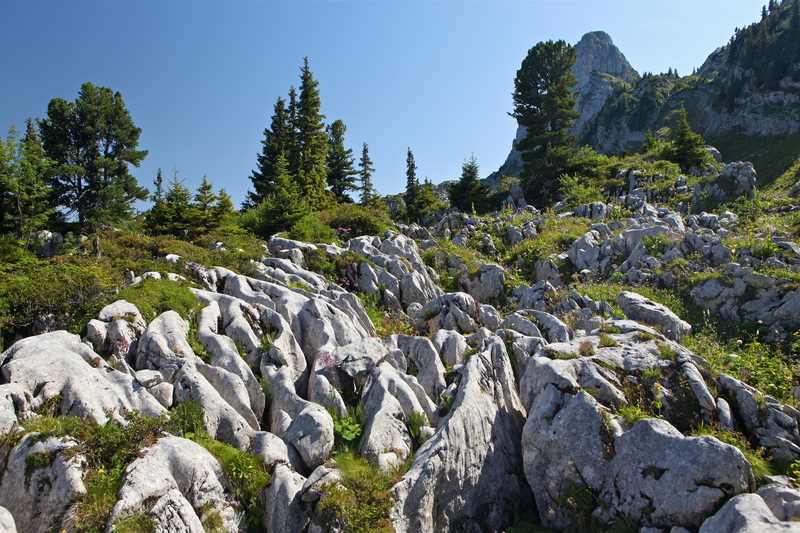 This trip offers a magnificent view over the plains and mountains. 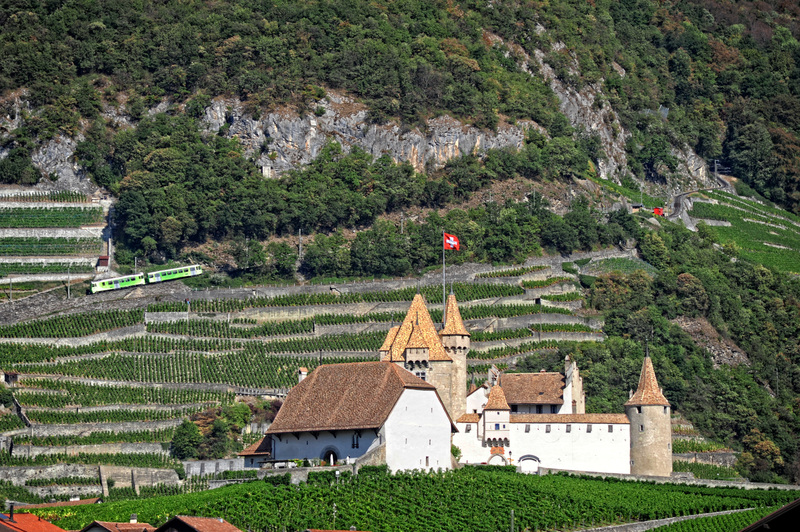 The train goes by vineyards, meadows and mountain pastures where you can observe animals such as deers and chamois in their natural environment. The cogwheel train Bex-Villars-Bretaye leaves the Rhone plain in Bex (424m) to reach the heart of the area of Villars (1300m) and Bretaye (1808m). 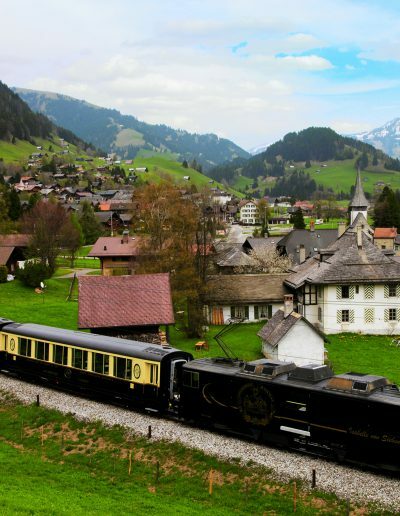 It is a historic railway built between 1898 and 1901 — Dinner and overnight in Villars. 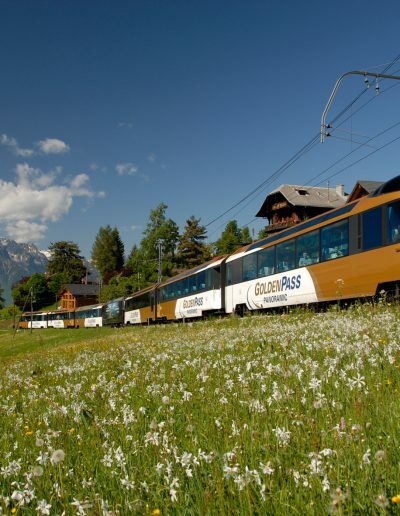 Taking the Postbus from Villars to Les Diablerets, the route continues to cross the Vaud Alps to the chic resort of Gstaad. 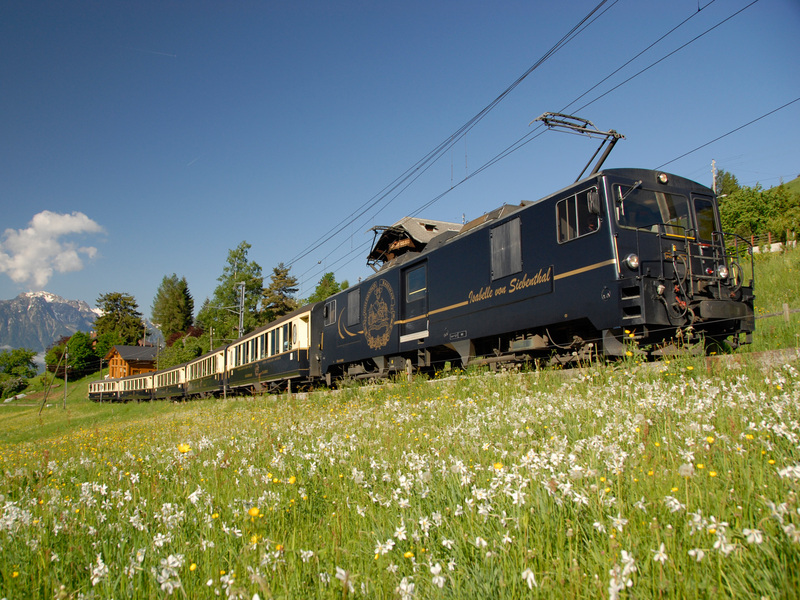 The connection is guaranteed by the famous Golden Pass Panoramic MOB line to the authentic village of Château-d’Oex, capital of the Pays-d’Enhaut — Dinner and overnight in Château-d’Oex. 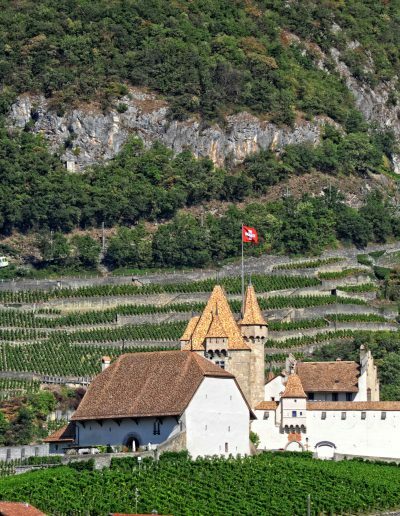 The last day of your tour, with the Golden Pass Classic to Montreux on the shores of Lake Geneva or direction Zweisimmen to continue to Interlaken or Lucerne.. 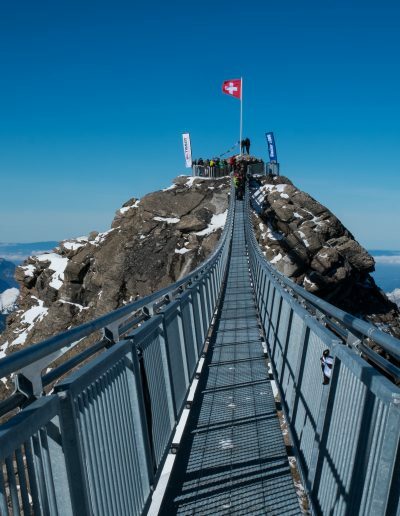 The price is mentioned in EUROS for information purposes, the only legal change is the swiss franc CHF, its conversion is proned to the fluctuation of the exchange rate. This form sends us a reservation request which will be confirmed after checking availabilities. No charge before the final confirmation of your stay. Upon receipt of your request, we check availability and you will receive a confirmation e-mail within 48 hours from Monday to Friday. This message presents the program of your stay, the details of the hotels and the bill. Upon receipt of your payment, we will send you a link to download your travel documents. Your travel documents will be emailed after receipt of your payment and at least 48 hours prior to your arrival in case of last minute booking. They include the details of the program with useful contacts, hotel bookings and a link for cards to print at home or to download on your smartphone. A complete tourist documentation is available at the tourist offices of each destination. Dogs are welcome on the tour and the hotels charge a contribution of around CHF 15.00 per dog / night. The luggage transfer service between each hotel is included up to a room of 20kg per person. You drop your luggage at the hotel reception at the time of check-out and you will find them at the following hotel no later than 16:00. If you do not want this service, please indicate it in the remarks of the booking form.